What we called cultural heritage, it isn’t limited to relics of the past. Although it is based on the traditional significance, at the same time it has the existing state oneself nowadays. But we don’t have to think about an ontological meaning but we need to consider why it still stands here. Amongst the variety aspects of this question, we can try to reflect on the resource of an inspiration to create contemporary art and culture. In this perspective, the cultural heritage is a representation of the historical identity of a certain community and it still exists as the physical and metaphysical evidences in our times. Therefore, the cultural heritage is able to transmit the sharing emotion and building the notion of people in their society from the first time when it established the original form to the present. However, sometimes we can witnessed tragic scenes of our cultural heritage for some reasons such as missing, damage and destruction by accidental or by violence. At any case of the accident, it provokes some subliminal emotions in our mind, like displeasure, grief and guilty. And the sensibility becomes trauma and the remembrance of the scene brings traumatic memory that grounded cultural identity. It is possible to called as cultural trauma that is related with social based memory and national characteristics according to their cultural roots and geopolitical situations nowadays. From this perspective, we should consider Sungnyemun gate fire as an historical catastrophe which evokes a traumatic memory. 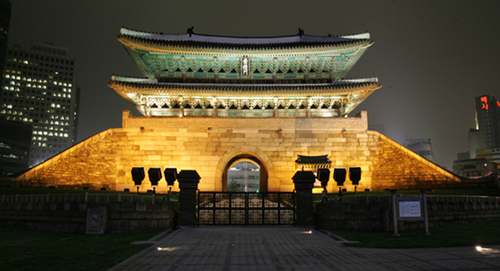 Sungnyemun gate was built in 1398 and it was designated as the Korean national treasure No.1 in 1962. The oldest wooden edifice in Seoul was burned down on 10th February 2008 by an arsonist, at that time many people were tremendously shocked and they fell into despair to see Sungnyemun burn into ashes only six hours after the fire broke out and were outright infuriated by the failed initial response of fire authorities and safety negligence of cultural property management authorities. One year after the site of Sungnyemun gate, where restoration work is still being conducted, is opened for public and the exhibition opened under the name of “Sungnyemun - Memory, Regret and Tomorrow” at the National Palace Museum of Korea until 8th March. What do we see from this site? It’s time to reflect the potential meaning of national treasure and in the both aspects of historical signification and spirit of our times, and we have to question by our selves, what do we see from now. Posted by Yun In Kim	on Sunday, March 8, 2009 at 14:25.